Crisis Resource Management refers to the extremely important but sometimes difficult to define “soft skills” that can make or break the function of a team. The concept was originally developed by the airline industry in response to research demonstrating that the large majority of airplane crashes occurred due to failures of the crew to effectively utilize resources. In this case, CRM referred to Crew Resource Management, which was a type of training designed to address these issues. Eventually, these ideas were brought to medicine by Gaba, Howard, Fish et al, who developed a curriculum for anesthesiologists.1 This group changed the name of the training to Crisis Resource Management, and the medical field has been calling it crisis resource management ever since. Being able to identify and label the skill components of CRM helps a simulation educator immensely. It is essential to address these skills during debriefing. In fact, cases can be designed specifically to elicit these skills. This should be no surprise. Communication is a basic tenant of good team function in any environment. Classically, good communication during a resuscitation is referred to as “closed loop communication.” This means 1) Clearly identifying who is being spoken to and delegating a clear, specific task to that person. 2) The recipient acknowledging what has been heard. 3) The recipient clearly stating when the delegated task has been completed. This stage is referred to as “closing the loop” on the initial order. Notice that the loop described is for one order. A common communication pitfall is to call out too many orders at once. Quality communication also means listening to suggestions and updates from team members and respectfully acknowledging them. There are many ways for the team leader to lead a case. The style of leadership is less important than the fact that there is leadership. Clear communication is part of this. But so is maintaining order and calm in the room, sharing your mental model with the team, and soliciting feedback and ideas from the team. Common pitfalls include not clearly establishing leadership during a resuscitation or having a leader that is not receptive to input from team members. This refers to the ability to optimize the roles and use of available personnel and equipment. A common pitfall of resource allocation is to forget that there are other resources in the room or outside the room. Does the team leader need to be the person intubating? Does the team leader notice that the medical student is standing in the corner while the nurse doing CPR is getting tired? Would the nurse be of more help administering medications and obtaining IV lines? Do the members of the team ask for help when they need it? Does the team change the monitor to cycle the blood pressure every two minutes instead of every fifteen when the patient status changes from well to unwell? This refers to the ability of the learner to perceive the many components of their environment. More importantly, it specifically addresses their understanding of what those components mean when combined to one whole. Does the learner recognize that they administered a medication and the patient’s blood pressure immediately dropped? When the patient starts wheezing and the oxygen saturations also drop, does the learner recognize that this could be a consequence of their medication administration? Does she even notice the change in vital signs? Debriefing around situational awareness often involves addressing a failure to recognize a problem, fixation on a single diagnosis or problem, (to the detriment of other possibilities or concurrent problems that require management) or failure to anticipate new problems or complications that may arise as a result of the illness or its treatment. This concept describes the process by which a learner must create a solution to a situation in which there is no routine answer. The process of developing a novel solution can be fraught with cognitive errors. Unpacking these errors can be a very valuable part of debriefing. It is important to note that for very junior learners, almost all situations are unique problems to be solved. (And hence, scenarios often do not need to be particularly complex.) More senior learners require more complex cases simply because they have a broader scope of familiar experiences. In order to challenge their problem solving, one must introduce them to an unexpected complication or a novel patient situation. These resources all describe the five CRM components listed above. They also look to the assessment of CRM skills. Gaba DM, Howard SK, Fish KJ, Smith BE, Sowb YA. Simulation-Based Training in Anesthesia Crisis Resource Management (ACRM): A Decade of Experience. Simul Gaming. 2001;32(2):175-193. doi:10.1177/104687810103200206. Gaba D, Howard S, Fish K. Crisis management in anesthesiology. New York: Churchill Livingstone Publishers; 1994. Kim J, Neilipovitz D, Cardinal P, Chiu M. A comparison of global rating scale and checklist scores in the validation of an evaluation tool to assess performance in the resuscitation of critically ill patients during simulated emergencies (abbreviated as “CRM simulator study IB”). Simul Healthc. 2009;4:6-16. doi:10.1097/SIH.0b013e3181880472. Hicks CM, Kiss A, Bandiera GW, Denny CJ. 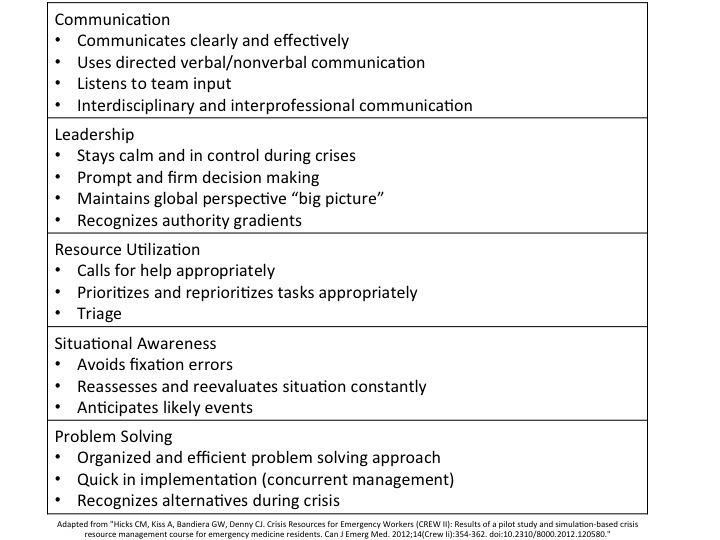 Crisis Resources for Emergency Workers (CREW II): Results of a pilot study and simulation-based crisis resource management course for emergency medicine residents. Can J Emerg Med. 2012;14(Crew Ii):354-362. doi:10.2310/8000.2012.120580.